LRW is a new wrap company based in London, UK. I had seen the brand pop up on Instagram and was really taken with the Flow design. The owner, Natasha, has a background in fashion but seems to have found her feet applying her skills in wrap design and production. I was really pleased to be asked to test Caspian. I have written this review in the format of the questionnaire that was sent with the wrap. Caspian arrived in a practical cotton tote with a really informative booklet. Some people might toss this aside but I’m always interested to see how a wrap company presents themselves throughout their product. I liked reading Natasha’s story; the wrapconomy is expanding like never before so it takes quite a bit to stand out. Engaging through well written and relatable narratives is one way to connect with customers and I think LRW do this well. I took Caspian out of the bag and said “wow”. I absolutely adore turquoise and this was a really, really intense colour. Fabulous. I was surprised by the weight of it, much more substantial than I usually expect from an cotton machine woven. It weighs approximately 300g m/sq and this is due to the quality Egyptian combed cotton but also the quite detailed and finely woven complex twill weave. 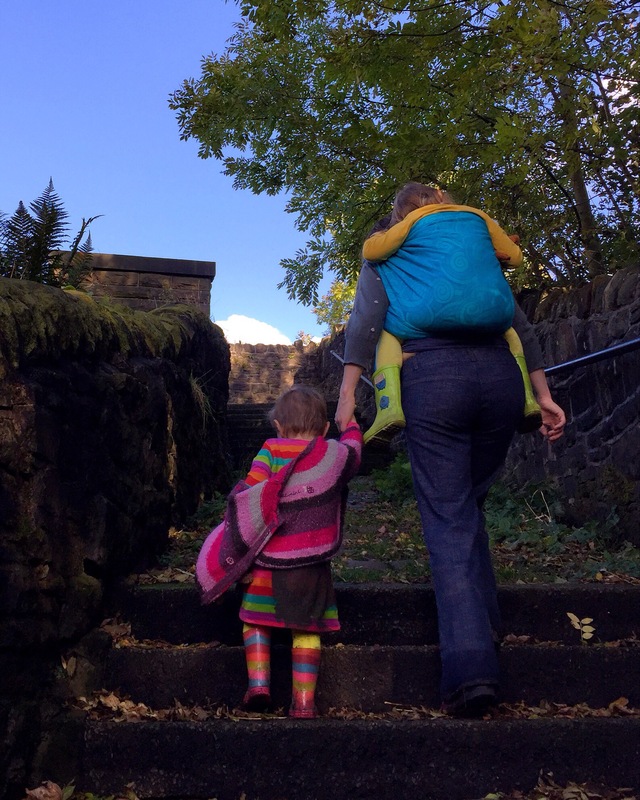 I commute with the girls and wear lots at the weekend so tried the usual quick go to carries such as a Ruck Tied Tibetan, a Double Hammock with a candy-cane chest belt, a Front Wrap Cross Carry and a Robin’s Hip Carry. I had the opportunity to test it with Smallest who is now 22m and my eldest who is 4.5 year old. Both girls are of average build; I don’t know how much they weigh as I hardly weigh them! My eldest was 17kg last time I checked for car safety purposes. Caspian is easy peasy lemon squeezy to use. Despite it being a heavier weight wrap it feels medium weight in hand and handles as such. Working with it resulted in no puce face and sweaty moments as passes just glided into place. It meant I needed to be slightly more attentive to tightening (I’m a total slack wrapper) but once my wrappee was up it held very well. In fact it has a fabulous elasticity that meant my chest pass in a double hammock meant I could have gone braless and been utterly supported. Yeah! It’s not a wrap I would lazily half knot but that’s fine, it packs down very neatly for a double knot. I particularly enjoyed it using a Robin’s hip carry with a ring as the fabric really cupped my shoulder and it was so supportive. Smallest stayed up for ages and in the end moved toys in to play with rather than get down. We spent a lazy Sunday morning like that and it was bliss. It got the acid test with my eldest on a walk. Typically, Smallest forged ahead falling in and out of muddy puddles whilst my eldest started to get a little whingy so I asked her if she wanted a carry? She did. Not only a carry but a wrap nap too which is a total rarity at her age. It’s a testament to the wrap as she can be a picky thing, both with my wrapping skills “mummy it’s too tight on my leg” and about the wraps “the rail hurts”. I kid you not. Anyway, I supermanned her into Ruck TT and not a single complaint. The wrap hugged us both so very well and she fell asleep in minutes. 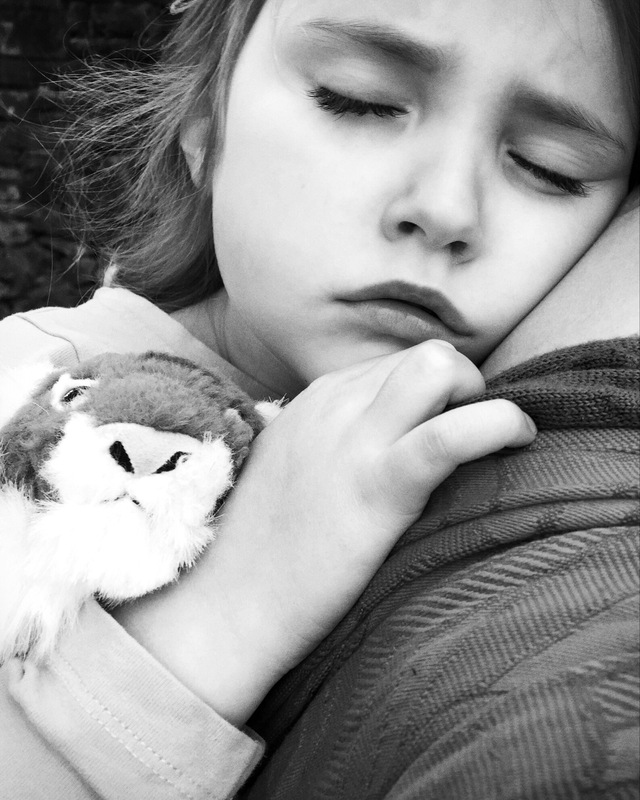 I walked up hill with her with on my back, holding Smallest’s hand. So there we go, Caspian rocks it with a reception school aged child. How did it compare to other wraps? I won’t lie, I love to wear blends so a cotton wrap has to work very hard to raise my eyebrow but Caspian does. It’s a solid wrap with some excellent wrapping qualities. As I reflect on how it carried my eldest I’d say it behaved like a high end wrap without the price tag. In fact I need to discuss this a little as LRW wraps are priced to be very accessible and are made to last. 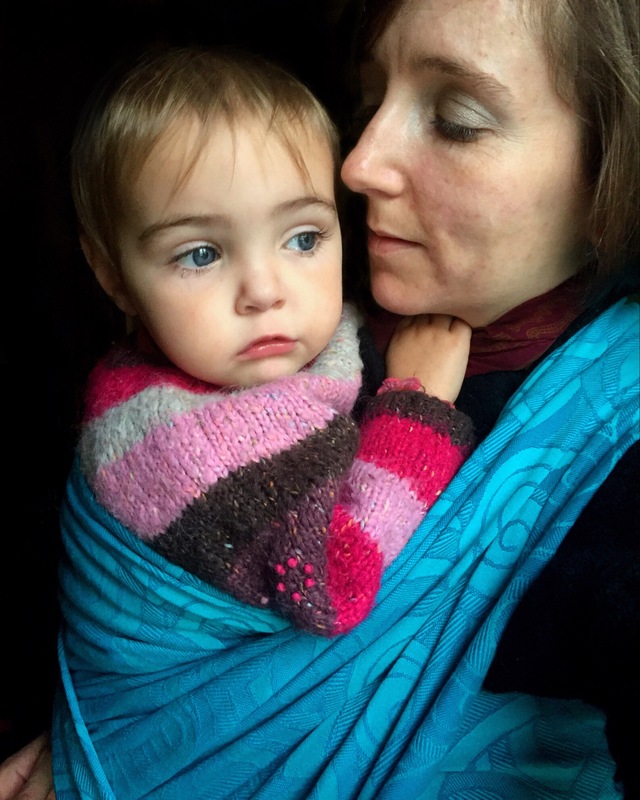 Realistically you could buy Caspian for a newborn (because it’s lovely and soft) and it would happily see you out to the end of your babywearing days. Great care has been taken with the weave and the finishing. I’m a stickler for finishing but couldn’t fault the stitching and thought the middle markers and tags were beautifully designed. If I compared the WQ and twill to any wrap it would be Sling Studio’s Spots N Stripes which is a pattern I love and has similar elastic qualities. Perfect. Don’t change a thing. How long have you got? The design of Flow lends itself to so many different colourways and blends. In particular I can see it making great use of different silks and linen along with natural bamboo and non fluffy wools. I was impressed by Caspian and it was really apparent how much thought had gone into it from the design, to use, to how it performed. 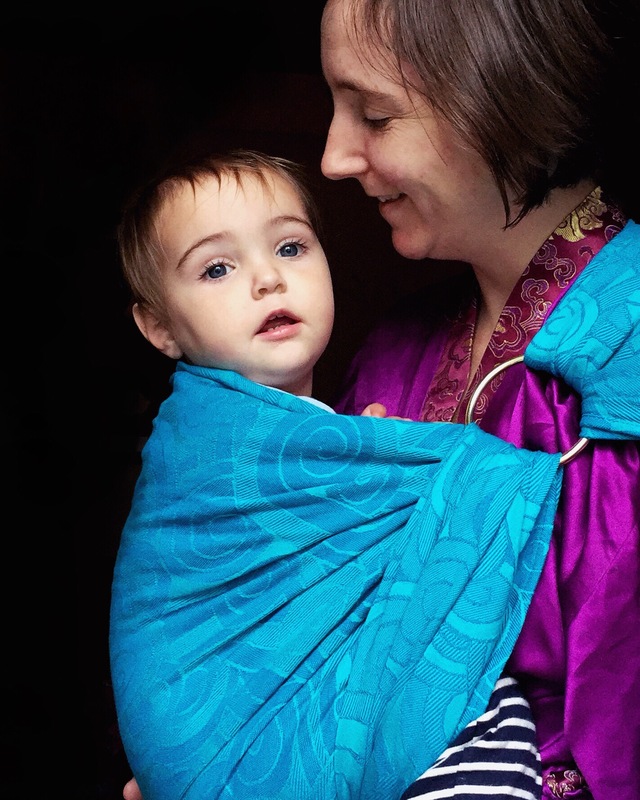 It’s not often I’d recommend a wrap that could last from birth to total independence but I honestly do with Caspian. For me, my memory of it will be walking up the railway bridge steps with my eldest snoring softly into my ear. I think that’s a pretty high accolade. You can access LRW through their Facebook page and chatter group.